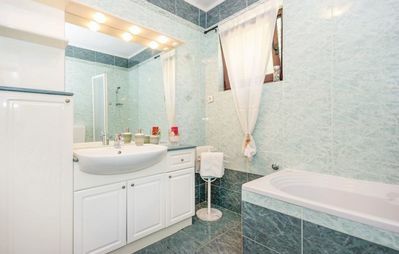 Ideal for friends, students and couples, this newly renovated apartment, situated in Kastel Stari in the Split suburbs, features 50m2 of delights. With accommodation for up to six people (two double bedrooms and a pull out sofa bed), this apartment has everything your group will need to enjoy your stay. Air conditioned, with free internet access and LCD TV, this apartment contains everything you need to enjoy your stay with us. The modern kitchen is fully equipped with a fridge, freezer, stove and oven, and the large spacious bathroom has a shower and a washing machine. 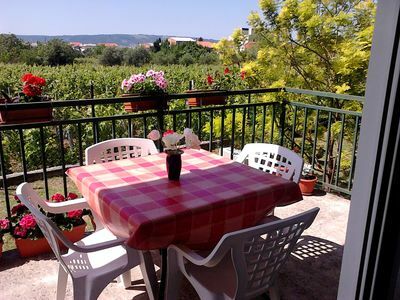 The beautiful apartment opens onto a gorgeous 10m2 terrace with an incredible vineyard view, barbecue and organic garden. If that isn’t enough, this delightful apartment is only moments from Kastel Stari’s beautiful beach. Free parking is also provided. A child’s cot is available on request. We offer you an invitation to come and experience Castel Vecchio Apartment North for yourselves. We look forward to hosting you. Baby cot is available and additional bed too.Smoking is allowed outside, but pets are not allowed.Free parking is provided. Local AreaKaštel Stari is one of the seven little settlements which make up the town of Kaštela. 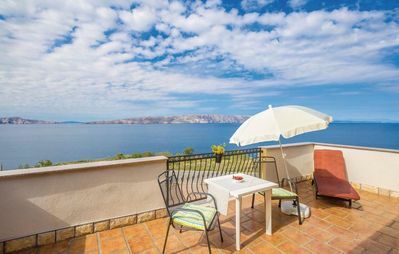 This apartment is just far enough away from the buzz of Split, yet close enough to allow you to indulge and relax as you desire.The local market, beach bars and restaurants are all close to Castel Vecchio. Split is just a mere 17km away, and is reachable by car, bus or taxi.During the summer Kaštel Stari offers amazing entertainment and cultural events, please contact us for more information.